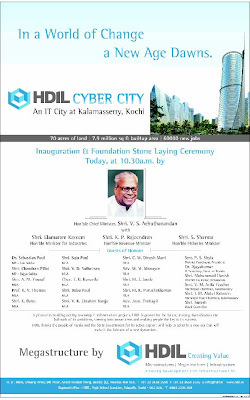 The new cynosure of Kerala media: HDIL Cybercity. After the kick starting of the Smart City project by Dubai Internet City, this was a new and bigger proposal to create another world class destination for IT industry in the blossoming Cochin techno heartland. Well, for a period of time there seemed to be no hassles as the foundation stone for the project was laid and the eye-catching futuristic township model appeared in major dailies. I was joyful, at the same time surprised at the absence of media interest (in terms of creating controversies) surrounding this big idea. Just for a moment i thought we are seeing a new media culture..or may be Rakesh Wadhawan (HDIL Chairman) must have filled the pockets of everyone concerned..
Alas, how wrong I was! Here comes Asianet with a special report about the dodgy land deal between HMT, on whose land Cybercity was proposed to be built, and HDIL, the principal promoter. The catch immediately caught the attention of the local media, who might already be miffed at HDIL sidelining them in the advertisement of the project. Then appeared a jobless MLA from the opposition group, claiming that "this is the largest land scam after Munnar" and "HDIL has poor track record" in development of IT Parks. The CM, who was to lay the stone for the project backed away saying that even his all-efficient and omnipresent IT Dept didn't have a clue about this project. The Industries Minister retaliated that he had indeed informed the CM, who handles the IT portfolio. Now the Revenue Dept is going to investigate thoroughly about the HMT-HDIL land deal, which was openly conducted through world wide tender. The situation is now full blown into a political-bureaucratic scandal, which will soon be entangled in a hopeless bundle once the Judiciary is also involved. The journos now have a full time job on their hands, just when their life was becoming dull after the IIST land issue seemed settled. The opposition party is also happy, they have got another opportunity to make life tough for the Govt. Even the ruling party seems pleased by the turn of the events, as the Cybercity is a pet of the group opposing the Kerala CM, and the success of the project would be perceived as a blow to the CM-led-group. Kerala public appears to be the happiest of the lot, as they now have an all round action thriller on screen. There seems to be apparently no losers. A project with a 4000 Crore investment, promising life for 60,000 educated youth and thousands of other unskilled workers is on its way to history. Anyone worried? At the back of my mind I knew this scandal was coming, and I don't intend to carry on as to why all this happen in Kerala, because it hurts...very badly. Ah, the obvious mistake is done by HDIL. How dare they chose Cochin, when Bangalore, Chennai and even Mysore, Coimbatore and Mangalore were all begging for the project?They must have shown the common sense to know that nothing works in God's own country.